Beautiful vellum certificate from the Newry, Warrenpoint & Rostrevor Railway Company issued in 1846. 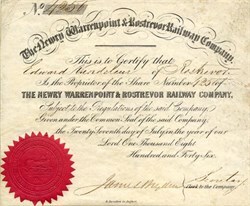 This historic document was printed by R.Hamilton Company and has an ornate border around it with an embossed red corporate seal of an old locomotive. This item has the signatures of the Company's Secretary and is over 162 years old. 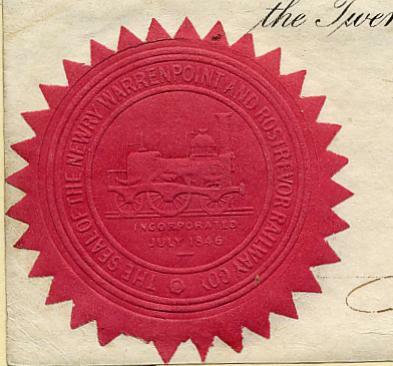 The Newry, Warrenpoint & Rostrevor Railway was authorised on July 27, 1846, and opened from Newry to Warrenpoint, a distance of six miles, on May 28, 1849. It was a single line, and completed the junction with the Newry and Armagh Railway. With the advent of the Newry, Warrenpoint and Rostrevor Railway opening in 1849, the way of life changed for the residents of Warrenpoint and the former mode of transport became obsolete overnight. Warrenpoint railway station opened on 9 May 1849 (and finally closed on 4 January 1965). Thousands flocked to the resort every year, where most took the passenger Ferry to Omeath in the Irish Republic. The Ferry still operates to this day but only in the summer months. A bandstand in the park provided concerts and a swimming pool was built in 1908. Warrenpoint has seen violence during the course of the Troubles, most notably the Warrenpoint ambush; for more information see The Troubles in Warrenpoint.